"How do I start a conversation about my end-of-life healthcare wishes?" "This is really uncomfortable." "What should I say?" These questions were asked over and over again by patients. 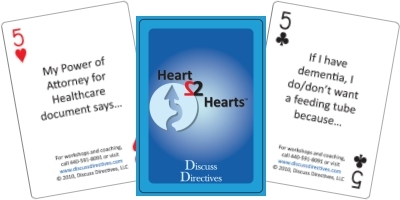 As a result, the Heart2Hearts® deck of cards were invented in order to provide 52 conversation starters. You may find that you want to use them to play poker or as a regular deck of cards. Be prepared to have the most meaningful Heart2Hearts® conversation of your life. Illness, death and dying are not topics that we like to broach How do we even begin to confront these issues? Heart2Hearts®: The Workbook makes starting the most important conversation of your life easier. By completing this innovative workbook and discussing it with your loved ones, you will give them a priceless gift...peace of mind. They will know your wishes and can follow them if you cannot make healthcare decisions for yourself. See complete information about Heart2Hearts®: Advance Care Planning. 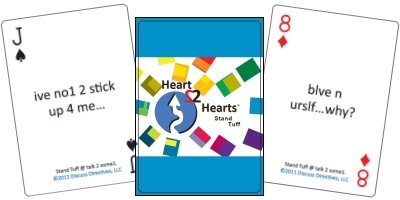 Heart2Hearts®: Stand Tuff deck of cards is a tool for identifying bullying behavior and ways to deal with it. The cards are presented in texting language as a result of focus groups with teenagers who didn't realize they had been bullied or have bullied others. This product will help schools, mental health centers and youth groups to develop open communication and ways to combat bullying. See complete information about Heart2Hearts®: Stand Tuff. 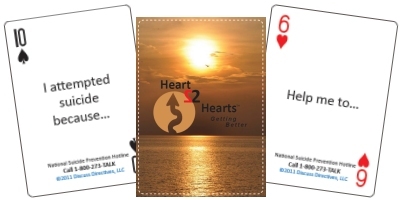 Heart2Hearts®: Getting Better deck of cards is designed for individuals who are in treatment for depression or suicide. It is a tool for the clinician to use as an ice breaker, for group therapy, for journal prompting, or for “homework” for a patient. The cards can be used for role playing how to improve communication with those you love as well as for self awareness of how you are feeling. See complete information about Heart2Hearts®: Getting Better. Heart2Hearts®: Army Edition is designed to identify symptoms of suicide and resources available for all active duty soldiers, veterans, National Guard members and reservists. Each card features a thought-provoking prompt. The cards can be used to start a conversation with your buddy, the chaplain, or family member. Whether used for playing solitaire or poker, this product provides self awareness for those in need. 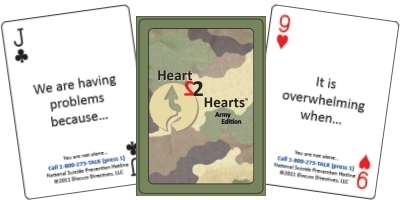 See complete information about Heart2Hearts®: Army Edition. Heart2Hearts®: Army Txt Ed. 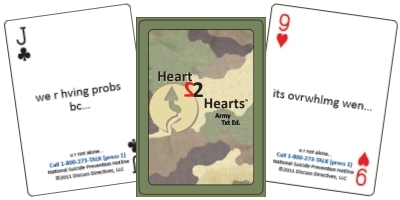 is a texting version of the Heart2Hearts® Army Edition cards that identifies the symptoms of suicide and resources available for all active duty soldiers, veterans, National Guard members and reservists regardless of location. A game card provides instructions in a game format of how to use these cards effectively. The purpose of these cards is to improve self awareness for yourself and your buddy in order to save lives. See complete information about Heart2Hearts®: Army Txt Ed.